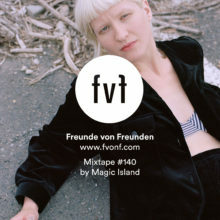 (EN) Last month we teamed up anew with Kitchensurfing for a new episode of FvF Cooks. (EN) Kitchensurfing is a in Brooklyn founded purveyor of local chefs from around the globe. With chefs in Berlin and across the U.S. the service matches you based on desired cuisine and price point. 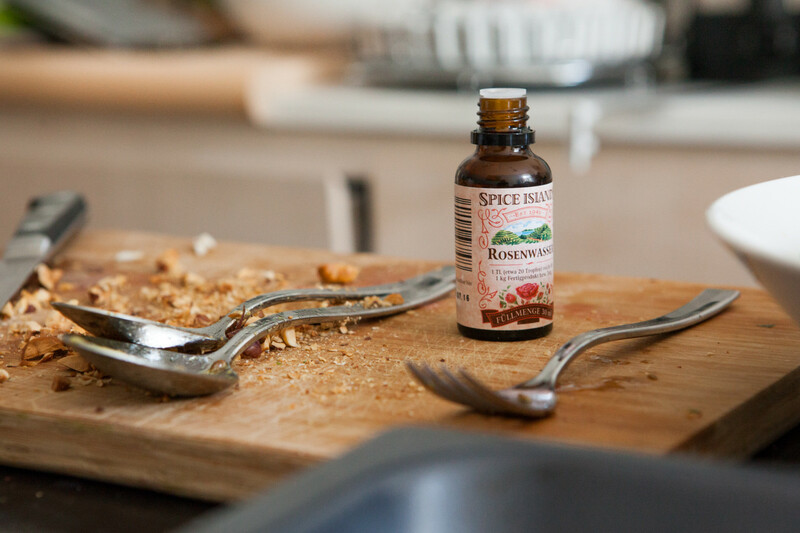 Once you’ve chosen, they do all the work, from shopping for ingredients to preparing the meal – and they take care of the cleanup – what more could you ask for? For their second meal for FvF and friends, Kitchensurfing again invited Canadian-born chef Leila Kristiansen, whose refreshing rustic approach to cuisine focuses on aroma and texture. 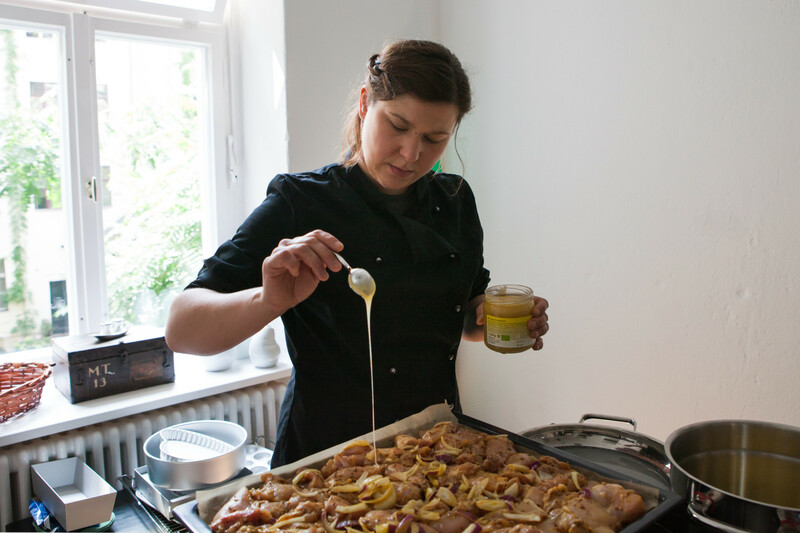 (EN) Leila got to work in the FvF Apartment, whipping up a mouth-watering lunch of saffron honey hazelnut chicken with rosewater combined with brown butter bulgur and a tomato zucchini salad for the main course. It was polished off in no time. 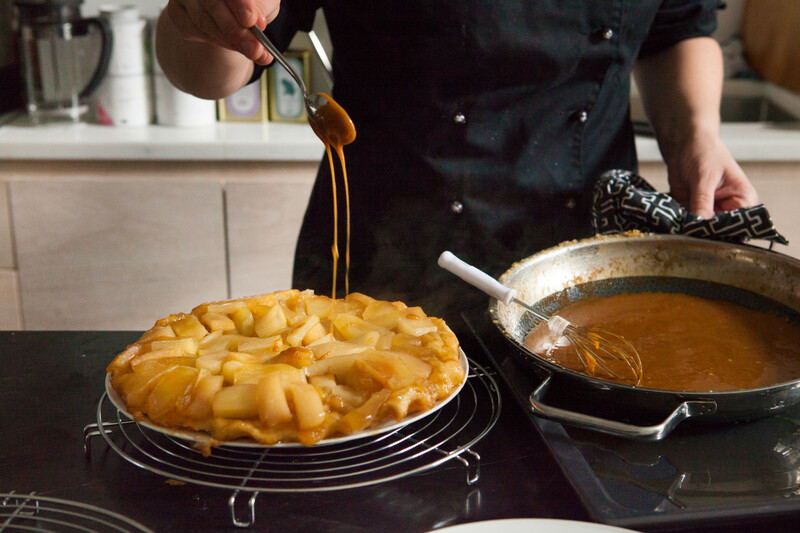 (EN) As the delectable smells of caramel came wafting out of the kitchen more than one team member found a reason to wander in, watching Leila tirelessly fold butter and sugar into a creamy caramel to drizzle over her Apple Tart Tatin. It disappeared in a matter of minutes – the team was satiated and not a crumb was left. (EN) Preheat oven to 250 degrees on the grill setting. In a large bowl, mix the chicken pieces with the onions, olive oil, ginger, cinnamon, saffron, lemon juice, salt, and pepper. Leave to marinate for at least an hour, or overnight in the fridge. (EN) Transfer the chicken to a pan and coat in honey. Roast for around 15 minutes, until cooked through. Place marinade in a pot and reduce over medium heat. 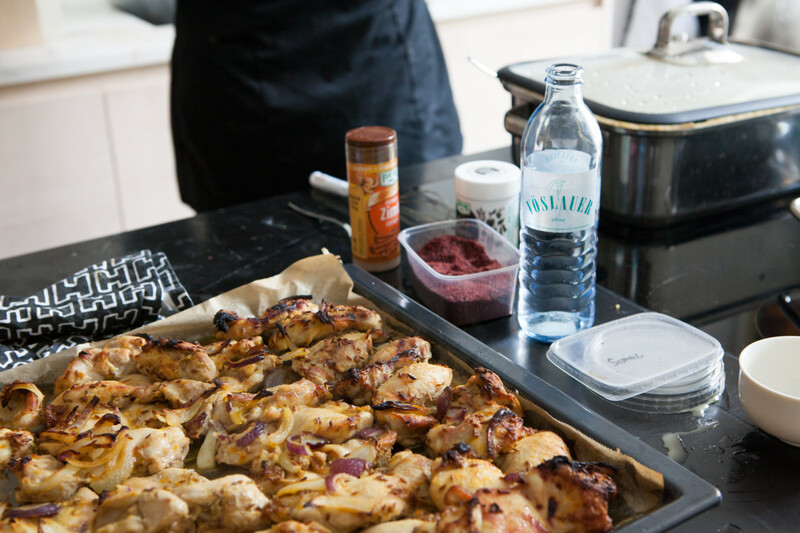 (EN) Remove the chicken from the oven, plate and pour over sauce, garnish with rosewater, hazelnuts & green onions. (EN) Put 1/2 cup of the flour and the salt into a mixer and mix with the butter until coarse. Add the other 1/2 cup and combine. Add the water until all is mixed and comes together. Pat out to a flat disc and chill for about 30 minutes. (EN) Use a heavy ovenproof skillet 22.5cm across and at least 5cm deep. Preheat the oven to 180 degrees. 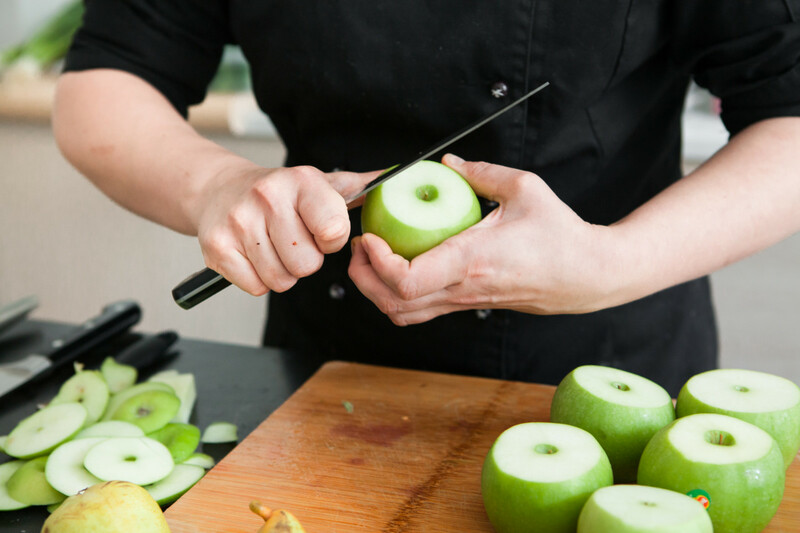 Peel the apples and core them. Cut the apples in half. Spread the sugar in an even layer in the skillet. Dot the butter on top of the sugar and then lay the apples round side down on top of the butter/sugar mix. Shingle the apple slices to make sure it’s packed tight, as they cook down they will shrink slightly. 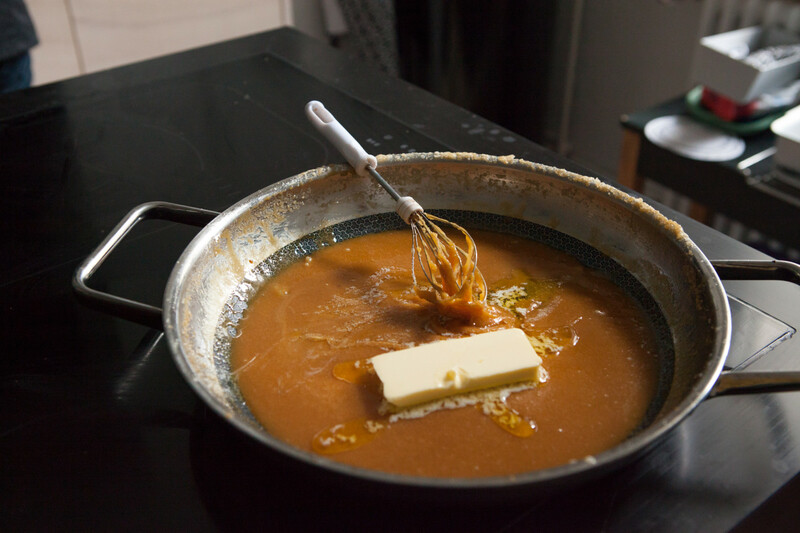 (EN) Place the pan over a medium heat to melt the butter and sugar. 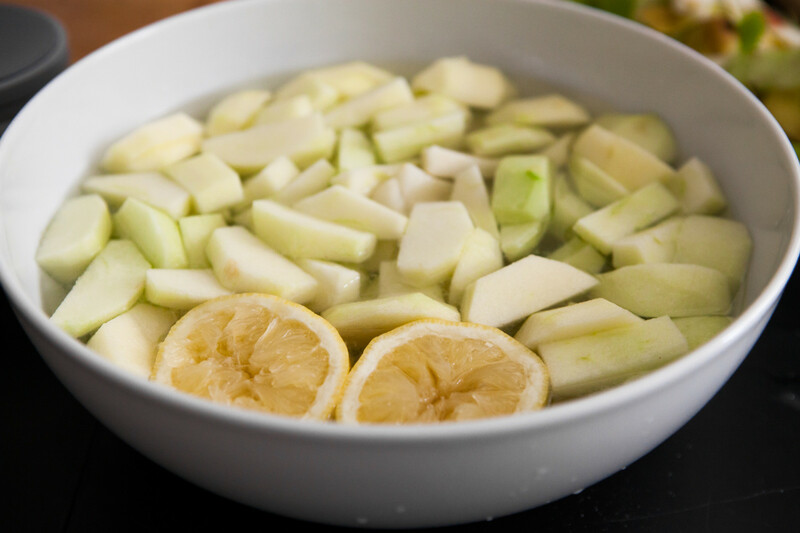 The liquid will come out of the apples and mix with the butter and sugar. This will increase the content to the top of the pan but after a while it will reduce. 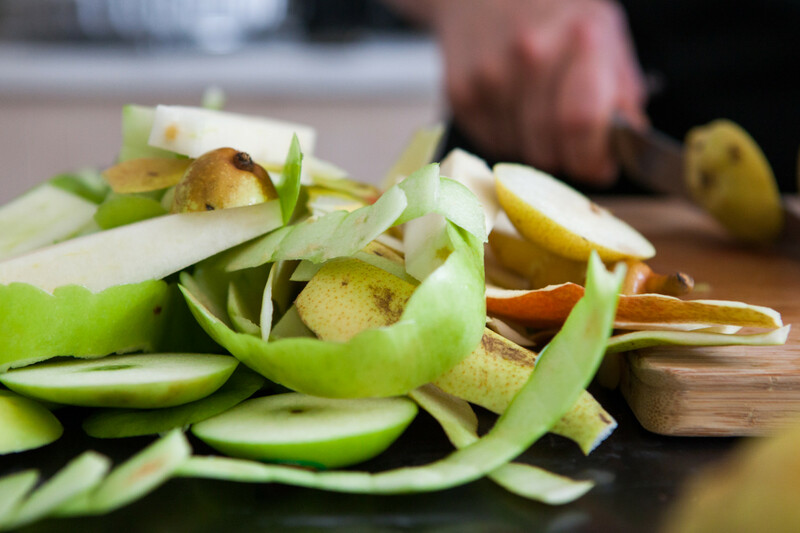 (EN) This step may take up to 1 hour to caramelize the sugar and brown the tops of the apples – so be patient and watch carefully. Look for bubbles that seem to move slower and watch for a golden caramel color. Once you have reached this point set the pan away from the heat and roll out your dough to a little larger than the pie dish. (EN) Top the apples with the dough and tuck in any excess at the edges. Put the pie into the oven and bake for about 40 minutes. (EN) After the pie is done leave it to rest for another 30 minutes. Have a dish or plate with a lip and lay it on top of the pie. 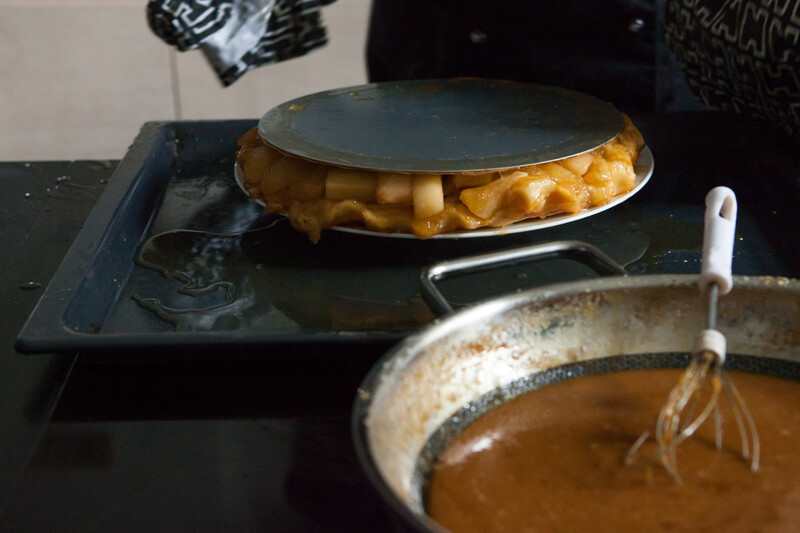 Quickly invert the tart onto the dish and gently lift off the pan leaving behind the tart and those golden caramelized apples. (EN) If any stick to the tart pan don’t worry, scrape them off with a knife and set them back into the spot where they came from on the tart. Serve warm with crème fraîche or vanilla ice cream. 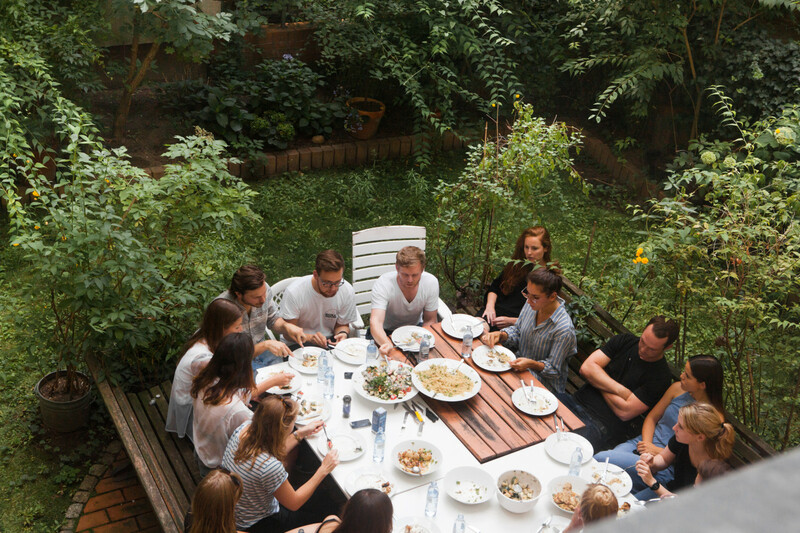 (EN) Thank you Leila and Kitchensurfing for this wonderful afternoon. 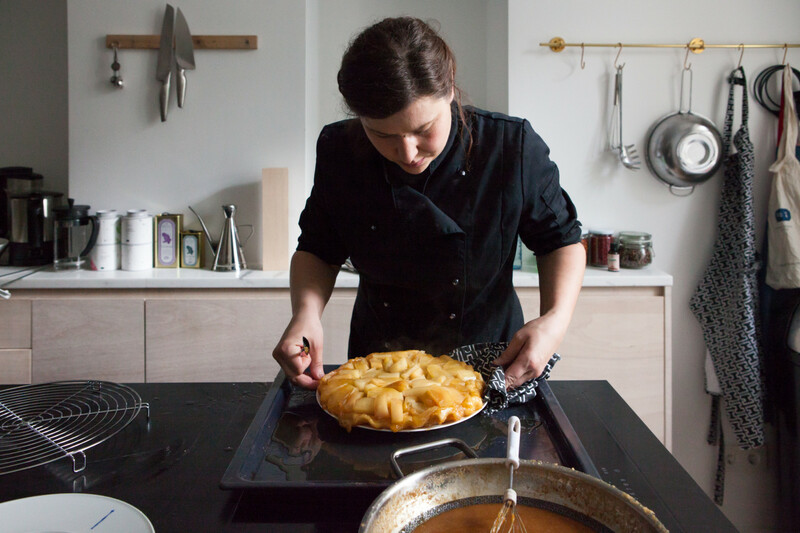 You can taste some of Leila’s dishes for yourself at the long-awaited, newly opened Comptoir du Cidre, which she runs with her brother Sidney Kristiansen. Not to be missed: the imported artisanal French Cidre – one of a kind in Berlin. (EN) This article is part of FvF Cooks – a selection of monthly inspiring and healthy meals and snacks by a range of FvF guests, contributors and industry experts. All the ingredients for these recipes were provided from Allyouneed.com. 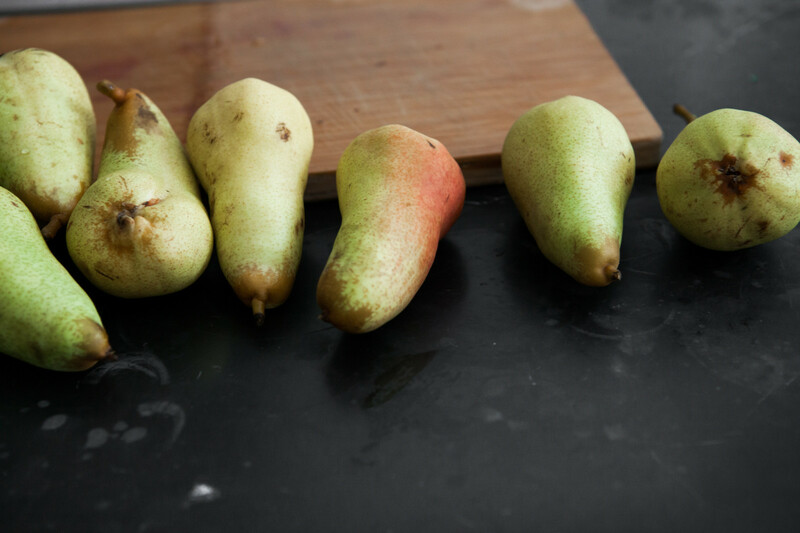 Find out more about Kitchensurfing and find the perfect chef for you and your friends here.